Sellers greeted Apple's blowout numbers last time, leaving investors on edge as earnings arrive after the bell. Updated since 11:41 am EDT with a late day stock price. CUPERTINO, Calif. ( TheStreet) -- Apple ( AAPL - Get Report) has adoring fans, but its investors are far harder to impress. The iPhone maker will post its fiscal second quarter results after the bell Tuesday and Wall Street wants nothing short of a bottom line blowout. But even that may not be enough, as we saw in January. Apple flew past fiscal first quarter analysts' targets on Jan. 25, delivering earnings of $3.67 a share. It was a solid 17 cents more than the consensus estimate. Unimpressed, investors had a mild immediate reaction followed by four days of heavy selling sending the shares down 5.4% by the end of Jan. 29. Since then, Apple shares have had an outstanding run up, and now trade 29% above that January low. So what part of that adventure awaits Apple investors later today? Will a strong set of numbers validate the recent run? Or will a big beat sound the bell for another stock selling spree? 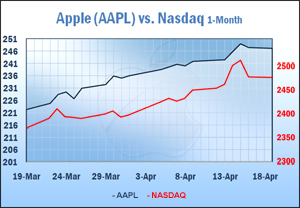 Apple's share appreciation has more than doubled the pace of the Nasdaq in the past three months. The stock hit all time highs riding on the heavy buzz surrounding the Apple iPad and the continued strength of the iPhone. But it will take an unusually strong performance to convince investors that the stock has even more room to rise above the broader market. If there are cautions, they revolve around Mac sales and iPhone demand. A recent refresh of the Mac computer line-up came after the fiscal second quarter closed. And rising anticipation of the new version of the iPhone may have dragged down enthusiasm for the current model. Analysts are looking for Apple to post earnings of $2.45 a share on sales of $12 billion, according to Yahoo! Finance. The so-called whisper numbers -- the ideal high-water mark that would register as a convincing beat -- varies dramatically. The seven investors surveyed by Whispernumber.com have a profit target of $2.45, which is in line with the Wall Street consensus. But other investors say the number has climbed as high as $2.60. The point, however, is that even if Apple blows past targets, the investment community may still find reason to sell, if for no other reason than to put some money in the bank. A good example of what to do with lofty Apple shares might be to look at the actions of Apple operations chief Tim Cook. When 300,000 shares of his restricted stock award vested on March 24, Cook didn't buy and hold -- he cashed out for $68 million. Apple shares were down less than a percentage point, to $245.55 toward the end of regular trading Tuesday. Investors might heed the whispers, but it's the roar of the sellers they need to gauge.